According to what traditionally is known as "The First Thanksgiving," the 1621 feast between the Pilgrims and the Wampanoag at Plymouth Colony contained waterfowl, venison, ham, lobster, clams, berries, fruit, pumpkin, and squash. William Bradford noted that, "besides waterfowl, there was great store of wild turkeys, of which they took many." 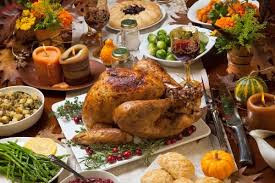 Many of the foods that were included in the first feast (except, notably, the seafood) have since gone on to become staples of the modern Thanksgiving dinner. Early feasts of the Order of Good Cheer, a French Canadian predecessor to the modern Thanksgiving, featured a potluckdinner with freshly-hunted fowl, game, and fish, hunted and shared by both French Canadians and local natives. The use of the turkey in the US for Thanksgiving precedes Lincoln's nationalization of the holiday in 1863. Alexander Hamilton proclaimed that no "Citizen of the United States should refrain from turkey on Thanksgiving Day," and Benjamin Franklin had high regard for the wild turkey as an American icon, but turkey was uncommon as Thanksgiving fare until after 1800. By 1857, turkey had become part of the traditional dinner in New England. A Thanksgiving Day dinner served to the Civilian Conservation Corps in 1935 included: pickles, green olives, celery, roast turkey, oyster stew, cranberry sauce, giblet gravy, dressing, creamed asparagus tips, snowflake potatoes, baked carrots, hot rolls, fruit salad, mince meat pie, fruit cake, candies, grapes, apples, clams, fish, and many other food harvests. French drip coffee, cigars and cigarettes. The White House Cook Book, 1887, by Mrs. F.L. Gillette, et al., had the following menu: oysters on half shell, cream of chicken soup, fried smelts, sauce tartare, roast turkey, cranberry sauce, mashed potatoes, baked squash, boiled onions, parsnip fritters, olives, chicken salad, venison pastry, pumpkin pie, mince pie, Charlotte russe, almond ice cream, lemon jelly, hickory nut cake, cheese, fruits and coffee. Sugar, among other food commodities, was rationed from 1942 to 1946. In 1947, as part of a voluntary rationing campaign, the Harry Truman Administration attempted to promote "Poultryless Thursdays," discouraging Americans from eating poultry or egg products on Thursdays. 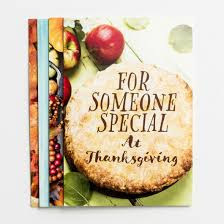 Because Thanksgiving is always on a Thursday, this meant that turkey and pumpkin pie, two Thanksgiving staples, were forbidden, not only for that holiday, but for Christmas and New Year's Day as well, since those holidays landed on Thursday in 1947. (Pumpkin pie was forbidden because it contained eggs.) The National Poultry and Egg Board furiously lobbied the President to cease promoting the plan; it culminated in a truce at the National Thanksgiving Turkey Presentation shortly before Thanksgiving. Turkey was no longer forbidden, but Eggless Thursdays remained for the rest of the year, meaning no pumpkin pie was served at the White House dinner that year. Turkey is the most common main dish of a Thanksgiving dinner, to the point where Thanksgiving is sometimes colloquially called “Turkey Day.” In 2006, American turkey growers were expected to raise 270 million turkeys, to be processed into five billion pounds of turkey meat valued at almost $8 billion, with one third of all turkey consumption occurring in the Thanksgiving-Christmas season, and a per capita consumption of almost 18 pounds (8.2 kg). The Broad Breasted White turkey is particularly bred for Thanksgiving dinner and similar large feasts; its large size (specimens can grow to over 40 pounds) and meat content make it ideal for such situations, although the breed must be artificially bred and suffers from health problems due to its size. Most Thanksgiving turkeys are stuffed with a bread-based mixture and roasted. Sage is the traditional herb added to the stuffing, along with chopped celery, carrots, and onions. Other ingredients, such as chopped chestnuts or other tree nuts, crumbled sausage or bacon, cranberries, raisins, or apples, may be added to stuffing. If this mixture is prepared outside the bird, it may be known as dressing. Deep-fried turkey is rising in popularity due to its shorter preparation time, but carries safety risks. The consumption of turkey on Thanksgiving is so ingrained in American culture that each year since 1947, the National Turkey Federation has presented a live turkey to the President of the United States prior to each Thanksgiving. These turkeys were initially slaughtered and eaten for the President's Thanksgiving dinner; since 1989, the presented turkeys have typically been given a mock pardon to great fanfare and sent to a park to live out the rest of their usually short natural lives. Non-traditional foods other than turkey are sometimes served as the main dish for a Thanksgiving dinner. Ham is often served alongside turkey in many non-traditional households. Goose and duck, foods which were traditional European centerpieces of Christmas dinners before being displaced, are now sometimes served in place of the Thanksgiving turkey. Sometimes, fowl native to the region where the meal is taking place is used; for example, an article in Texas Monthly magazine suggested quail as the main dish for a Texan Thanksgiving feast. John Madden, who appeared on television for the NFL Thanksgiving Day game from 1981 to 2001, frequently advocated his fondness for the turducken, deboned turkey, duck and chicken nested inside each other then cooked. In a few areas of the West Coast of the United States, Dungeness crab is common as an alternate main dish, as crab season starts in early November. Similarly, Thanksgiving falls within deer hunting season in the Northeastern United States, which encourages the use of venison as a centerpiece. Vegetarians or vegans may have a tofu, wheat gluten or lentil-based substitute; or stuffed squash. In Alaskan villages, whale meat is sometimes eaten.Irish immigrants have been known to have prime rib of beef as their centerpiece since beef in Ireland was once a rarity; families would save up money for this dish to signify newfound prosperity and hope. Many offerings are typically served alongside the main dish—so many that, because of the amount of food, the Thanksgiving meal is sometimes served midday or early afternoon to make time for all the eating, and preparation may begin at dawn or on days prior. Copious leftovers are also common following the meal properly. 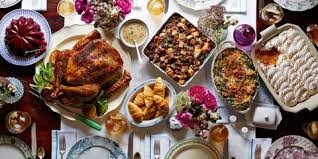 Traditional Thanksgiving foods are sometimes specific to the day of riced potatoes, and although some of the foods might be seen at any semi-formal meal in the United States, the meal often has something of a ritual or traditional quality. Many Americans would say it is "incomplete" without cranberry sauce, stuffing or dressing, mashed potatoes and gravy, and brussels sprouts. Other commonly served dishes include winter squash and sweet potatoes, the latter often prepared with sweeteners such as brown sugar, molasses, or marshmallows. Fresh, canned, or frozen corn is popular and green beans are frequently served; in particular, green bean casserole, a product invented in 1955 by the Campbell Soup Companyto promote use of its cream of mushroom soup, has become a Thanksgiving standard. A fresh salad may be included, especially on the West Coast. Bread rolls or biscuits and cornbread, especially in the South and parts of New England, are served. For dessert, various pies are usually served, particularly pumpkin pie, though apple pie, mincemeat pie, sweet potato pie, and pecan pie are often served as well. There are also regional differences as to the stuffing or dressing traditionally served with the turkey. The traditional version has bread cubes, sage, onion and celery. Southerners generally make their dressing from cornbread, while those in other parts of the country make stuffing from white, wheat or rye bread as the base. One or several of the following may be added to the dressing/stuffing: oysters, apples, chestnuts, raisins, and sausages or the turkey's giblets. 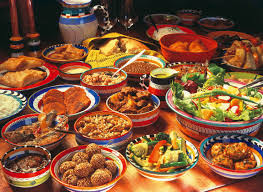 Other dishes reflect the region or cultural background of those who have come together for the meal. For example, Sauerkraut (among those in the Mid-Atlantic; especially Baltimore) is sometimes served. Many African Americans and Southerners serve baked macaroni and cheese and collard greens, along with chitterlings and sweet potato pie, while some Italian-Americans often have lasagne on the table and Ashkenazi Jews may serve noodle kugel, a sweet dessert pudding. Other Jewish families may consume foods commonly associated with Hanukkah, such as latkes or a sufganiyah; the two holidays are usually in close proximity and on extremely rare occasions overlap. It is not unheard of for Mexican Americans to serve their turkey with mole and roasted corn. 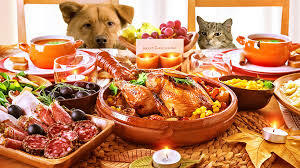 In Puerto Rico, the Thanksgiving meal is completed with arroz con gandules (rice with pigeon peas) or arroz con maiz (rice with corn), pasteles (root tamales) stuffed with turkey, pumpkin-coconut crème caramel, corn bread with longaniza, potato salad, roasted white sweet potatoes and Spanish sparkling hard cider. Turkey in Puerto Rico is stuffed with mofongo.Cuban-Americans traditionally serve the turkey alongside a small roasted pork and include white rice and black beans or kidney beans. Vegetarians or vegans have been known to serve alternative entree centerpieces such as a large vegetable pie or a stuffed and baked pumpkin or tofu substitutes. Many Midwesterners (such as Minnesotans) of Norwegian or Scandinavian descent set the table with lefse. The beverages at Thanksgiving can vary as much as the side dishes, often depending on who is present at the table and their tastes. Spirits or cocktails sometimes may be served before the main meal. On the dinner table, unfermented apple cider (still or sparkling) or wine are often served. Pitchers of sweet tea can often be found on Southerntables Beaujolais nouveau is sometimes served, and the beverage has been marketed as a Thanksgiving drink since the producers of the wine (which is made available only for a short window each year) set the annual release date to be one week before Thanksgiving beginning in 1985, and it is said to pair well with the wide variety of food served for Thanksgiving dinner. Thanksgiving marks the beginning of eggnog season. In the United States, a globalist approach to Thanksgiving has become common with the impact of immigration. Basic "Thanksgiving" ingredients, or the intent of the holiday, can be transformed to a variety of dishes by using flavors, techniques, and traditions from their own cuisines. 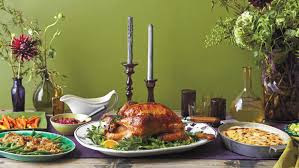 Others celebrate the holiday with a variety of dishes particularly when there is a crowd to be fed, guest's tastes vary and considering the financial means available.